Developers could lose their liquor license if they don't begin construction on this waterfront site this year. Rejecting a staff recommendation, the Common Council voted Tuesday to renew a liquor license for the long-delayed Morgan District project but with a warning that it could be revoked if there isn't significant progress on the project before the end of the year. The staff’s proposal to strip the license from the developer is part of an effort by the city to reclaim inactive liquor licenses. Traditionally the city has allowed license holders to retain their licenses during business transitions but has decided that it needs to have greater control over the situation. Peter Lang, one of the partners in the Morgan District project, persuaded the council to let his group hold on to the license by arguing that the development is finally moving forward and that losing the license might make it harder to attract commercial tenants. The developers have held the license since 2015. The Morgan District was originally proposed two years ago as a $55 million project that would include 400 housing units, a grocery story and 48,000 square feet of additional commercial space. Construction was expected to begin in fall 2016. 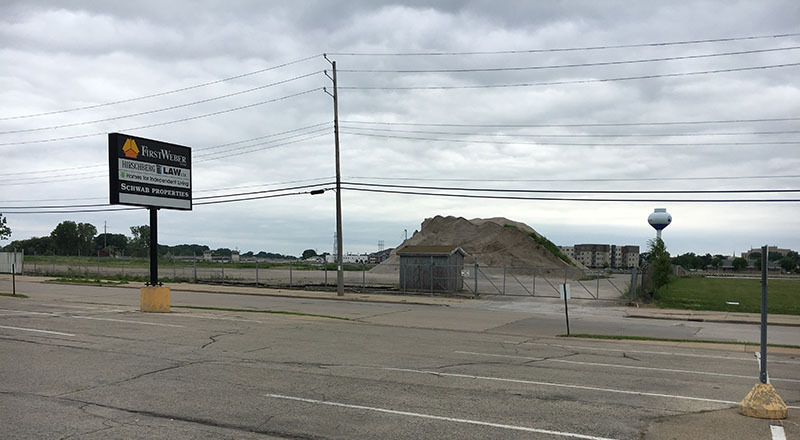 But the parcel, which had been used as a storage lot for military vehicles built by Oshkosh Corp., has remained largely empty. Its distinguishing feature today is a large pile of rubble even though its riverfront location should make it one of the most attractive development sites in the city. The site is bordered by the Fox River and Sixth Avenue and includes parcels on both sides of Oregon Street. A series of issues has beset the project, including the question of whether the nearby Oregon Street bridge would be converted into a fix-height span and whether Oshkosh Corp. could be persuaded to build its corporate headquarters there. The bridge decision was put on hold, and the company chose another site. Lang said the current plan is to build four apartment buildings, with 50 to 60 units apiece, on 15 acres of land west of Oregon Street. If plans are approved construction could start by the end of the year, he said. Other sections of the 36-acre site would be developed in later stages, he said, based on market demand. Mayor Steve Cummings was the most outspoken opponent of granting the liquor license. He argued that in the interest of fairness to other developers inactive licenses should be pooled by the city and doled out as projects move toward readiness. Ultimately Cummings joined all other councilors except for Steve Herman in approving the renewal. But the vote came after several council members expressed concern about getting the project started by the end of the year. Council Member Tom Pech Jr. warned Lang that he would go further and initiate proceedings to have the license revoked if the developers have not made progress on getting the license back into use.